Amid the cacophony of Blair-hatred that has accompanied his book release, it is worth remembering that the economic crisis wasn’t entirely his fault, nor Brown’s for that matter. Yes, they out-Thatchered Thatcher. Yes, they let the banks run riot and plunged the state into the red in bailing them out. Yes, they allowed inequality to increase and failed to enact any kind of industrial policy. No, it probably wasn’t a good idea to make the Bank of England independent because it held interest rates too low for too long. But policy mistakes aren’t the whole story. In one of the best books on the economic crisis that i’ve read, Graham Turner highlights the historic origins of the crisis. He points out that capitalism inevitably features booms and busts due to the tendency of the rate of profit to fall following periods of rapid expansion. Companies compete furiously in the upturn, with what Marx called the ‘roving cavaliers of credit’ creating fake sources of investment because they are so desperate for returns. This process inflates a debt bubble. Sooner or later the new forms of capital – which in the most recent crisis took the form of ever more exotic forms of derivative — are exposed as fictitious. Profit rates decline and the bubble bursts. Like Turner, Post-Keynesian economists like Steve Keen have for years drawn attention to the massive rise in personal debt that took place over the last three decades. The rise in fictitious forms of investment capital and the surge in personal borrowing effectively helped interest rates to remain at very low levels throughout the 1990s and into the next decade. The internationalisation of capital added fuel to the fire. China’s boom, based partly on the insatiable demand of the American consumer, meant that it became the biggest buyer of US Treasuries, helping hold interest rates down. In sum the past two to three decades have involved a massive increase in global financial flows, coupled with an unprecedented rise in debt. 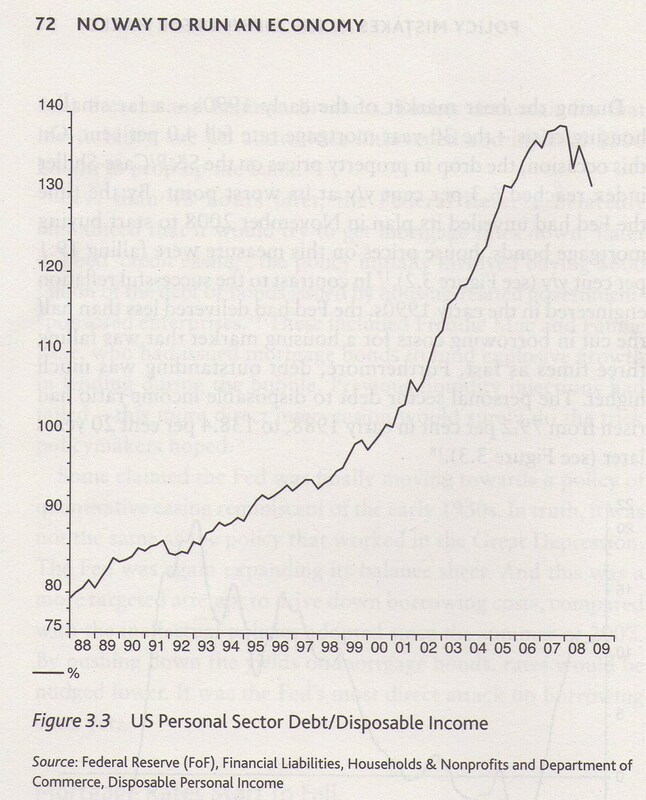 The resultant reduction in the cost of borrowing inflated one bubble after another, the last of which was in housing. So while Blair, Brown, Clinton, Bush et al. made some dreadful mistakes, and we wouldn’t be in half the mess we’re in if they’d properly understood the likely consequences of the debt explosion, it was not so much policy that drove the bubble, as the bubble (in part) driving policy. This might seem fatalistic, but it’s more realistic than a picture in which domestic policy is entirely at fault. Blaming everything on Blair is almost as misguided as the hubris that surrounded his and Brown’s claim to have ended the business cycle. Capitalism is dynamic, and it is prone to booms and busts.